Disclosure: This post is sponsored by JORD. I received product in exchange for this post. All opinions are 100% my own. I love Valentine’s Day. Maybe it’s because it’s another fun opportunity to throw together a gift for my husband (after the holidays), but I’m also a hopeless romantic. I love the idea of giving something meaningful to that special someone and spending quality time with them. 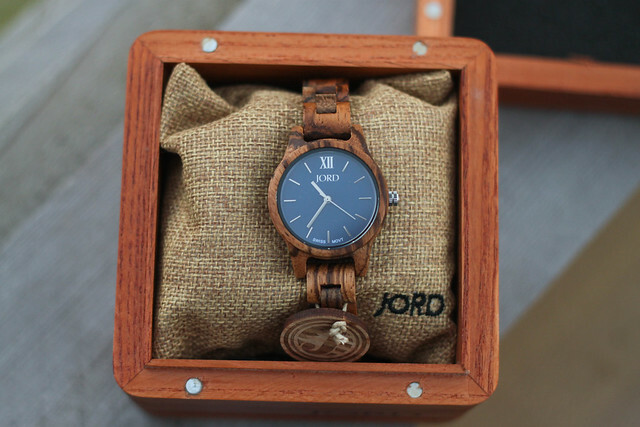 When I first heard of JORD, I thought that these wood watches would make a perfect gift for Valentine’s Day. I have never seen such a unique watch like this before. 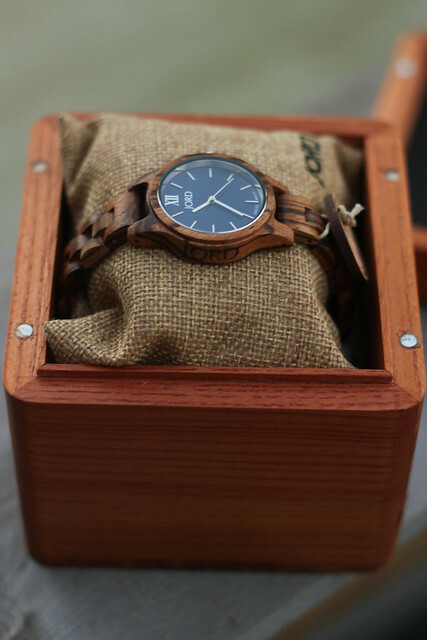 Their men and women wood watches are completely stunning, and unlike anything I’ve ever seen in stores! So many of their watches caught my eye, but the product I decided to review was their Frankie 35 watch. Besides the beautiful watch, I was really impressed by the packaging. The watch comes in a gorgeous wooden box, with the watch surrounding a small burlap pillow. It’s gorgeous and definitely gift-worthy! The watch was custom-fitted to my wrist as well. I have really small wrists, and while I know you can have watches resized, it’s a nice added touch to have it fitted to your wrist already when you gift it to someone. The wooden watch band that I received was rich and beautiful…the pictures hardly do it justice! I feel like this is a wonderful idea for a Valentine’s Day gift. 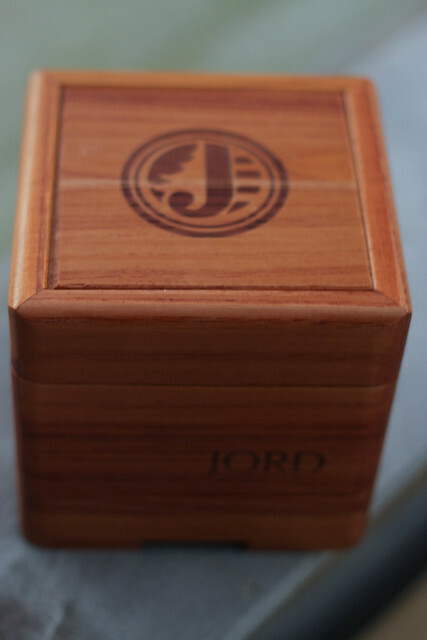 It’s beautifully packaged, completely unique and I can completely appreciate the range of prices that JORD has available in their watches! Are you interested in JORD watches? JORD is generously offering a contest through The Nifty Foodie. One winner will receive a $100 e-gift code, and EVERYONE who enters will receive a $25 e-gift code. All e-gift codes will expire on 3/31/2017. Note: This giveaway is supplied by and coordinated through JORD, and is open to readers in the continental US only over the age of 18. Entries will be accepted until January 29th, 2017. JORD will receive your email address, and it may add you to a mailing list. Winner will be contacted by JORD. All e-gift codes will expire on 3/31/2017. When it also comes to Valentine’s Day, I really enjoy making a nice dinner for my husband and me. I’m not a fan of waiting 2-3 hours in a restaurant, and since I’m a fan of cooking and baking, it’s a no brainer to DIY a Valentine’s Day dinner! One of my favorite indulgences around Valentine’s Day is chocolate, and while I enjoy making a nice, elaborate dinner, I try to keep dessert on the easier side (to where it’s prepared ahead). This flourless chocolate cake is not only indulgent, it’s very quick to throw together. If your special someone is a lover of chocolate, I’d highly encourage you to give this a try. It’s super rich and there’s no shortage in chocolate flavor here! Preheat the oven to 375 degrees F, and butter an 8-inch round cake pan. Line the bottom of the cake pan with parchment paper. Chop the bittersweet chocolate into small pieces, add the butter, and melt the chocolate mixture (by double-boiler or microwave). To melt in the microwave, melt the chocolate mixture in a glass bowl in 30 second increments at 50% power, stirring after each cooking cycle, until melted. To melt in a double boiler, either use a double boiler or metal bowl set over a saucepan of barely simmering water, stirring well until smooth. After the chocolate mixture has melted, whisk the sugar into the chocolate mixture. Add in the eggs, vanilla extract & salt and whisk the mixture well. Sift in 1/2 cup of the cocoa powder over the mixture and whisk until just combined (do not overmix). Pour the batter into the cake pan, and bake in the middle of the oven for 25 minutes, or until the top of the cake has formed a thin crust. Remove the cake from the oven, and cool the cake in the pan on a cooling rack for 5 minutes. Invert the cake onto a serving plate. 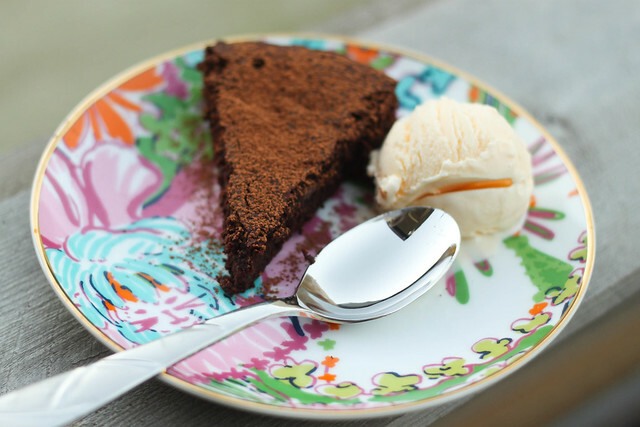 Dust the cake with additional cocoa powder and serve with sorbet or ice cream. Enjoy!